Want something different for Thanksgiving? Stuffed mushrooms might fit the bill. I searched around for recipes, but I had an idea that I wanted to use wild rice, so I just went from there. Who needs a recipe? 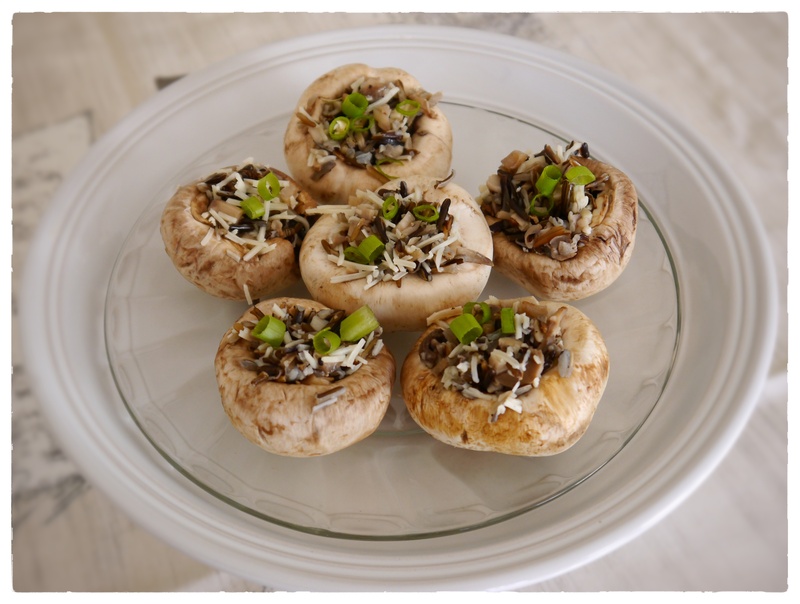 I used large button mushrooms because they were appetizers, but I think it would work with portobello mushrooms for a main course or nice side. Pop Quiz: Is wild rice actually rice? Answer: Nope, it’s a grass. The best way to cook wild rice, is to bring a saucepan filled with water to a boil add salt and (well washed) wild rice, reduce heat to simmer and cook for 60 minutes, or until the rice is cooked. You’ll want it chewy, try not to overcook it, because then it just gets mushy. Drain as you would pasta, don’t rinse. Snap stems off mushrooms and chop. Place the mushroom tops, bottom up, in the baking dish. Melt butter in a medium size skillet. Add garlic and mushroom stems. Cook over medium heat, stirring, 3 minutes. Add rice and mix well. Salt and pepper to taste. Remove from heat and add Parmesan cheese. Spoon wild rice mixture into the mushroom caps. Top each with two or three leaves of rosemary. Bake in a 400°F oven for 10-15 minutes or until hot. Serve warm. You can put the mushrooms together ahead of time (I did it the night before), cover and refrigerate and bake just before company arrives. This was my very first (!) pie attempt. In a saucepan, add sugar, cornstarch, water and 1 cup blueberries. Bring to a rapid boil, stirring constantly until thickened. Remove from heat and set aside to cool. Once cool, add 3 cups of blueberries, lemon juice and lemon zest, fold in completely. Cool in refrigerator until time to put the pie together. I also chilled the bowl I mixed everything in, as well. Cut butter into small pieces (I actually cut frozen butter, it was easier) and place in the freezer to chill it completely. Whisk together flour, sugar and salt. Using a pastry cutter, cut in butter until it is crumbly. Drizzle in the water and mix together until it forms a loose ball (do not over mix, you want visible butter pieces). Turn out onto a floured surface, knead gently, divide into two equal pieces (I weighed them), form each into a ball and wrap tightly in plastic wrap. Refrigerate for at least an hour. While I was at it, I refrigerated my marble rolling pin and marble pastry board. To assemble pie: roll out one of the balls until it’s about 12-13 inches (depending on your pie plate size) and about 3/16” thick. To move to your pie plate, flour your rolling pin again and fold the dough over it, transfer to the plate and it should fall into place. Gently form it to the plate and let excess dough overhang the edge – you can brush the edge with water before adding the top pastry. With all the butter, this step really isn’t necessary, it quickly seals itself. Add blueberry filling. Roll out second ball to the same size and thickness. Move to the plate and adjust over the pie plate. Now you can trim the excess dough, or you can tuck it under and then pinch to flute it. Next time I’m sure I’ll experience one of those, but this time, it was pretty skimpy for me to flute. Bake at 425 degrees for 20 minutes, reduce heat to 375 and continue until golden brown (I had to bake another 40 minutes). You’ll probably have to tent the edges with foil to keep them from burning. I did that at the 25 minute mark. 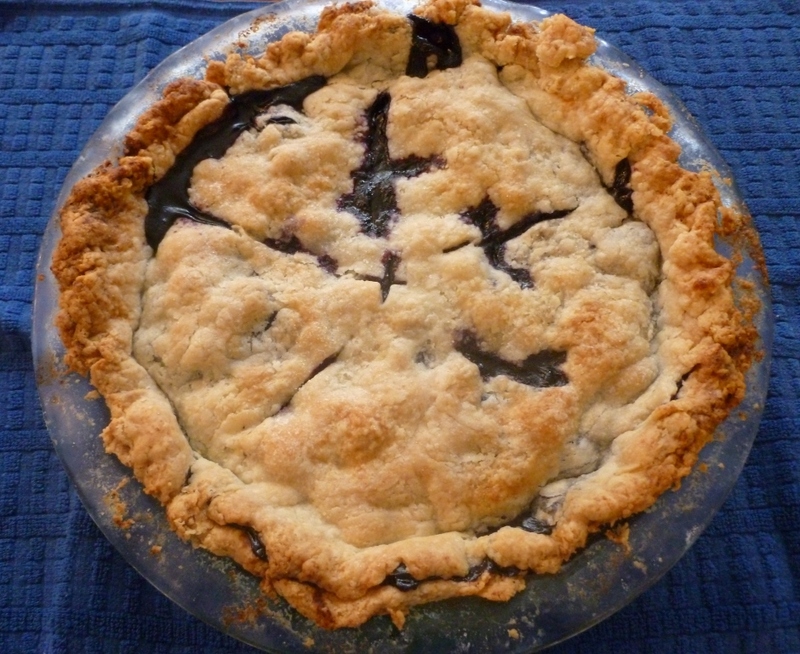 Let cool until just warm to touch for the blueberries to set if you want to serve warm. Is this thing on? I know it’s been forever – the house, work and puppies have taken most of my time. Cooking lately is mostly just for sustanance, nothing terribly creative. But Thanksgiving is almost here! Time to get cookin’. Thanksgiving is my favorite holiday, next to 4th of July. Food, family, friends…and leftovers. I’m going to have a house full this year and I’m excited to host. Although I wasn’t expecting to have a puppy thrown in the mix, but that just makes it more interesting. 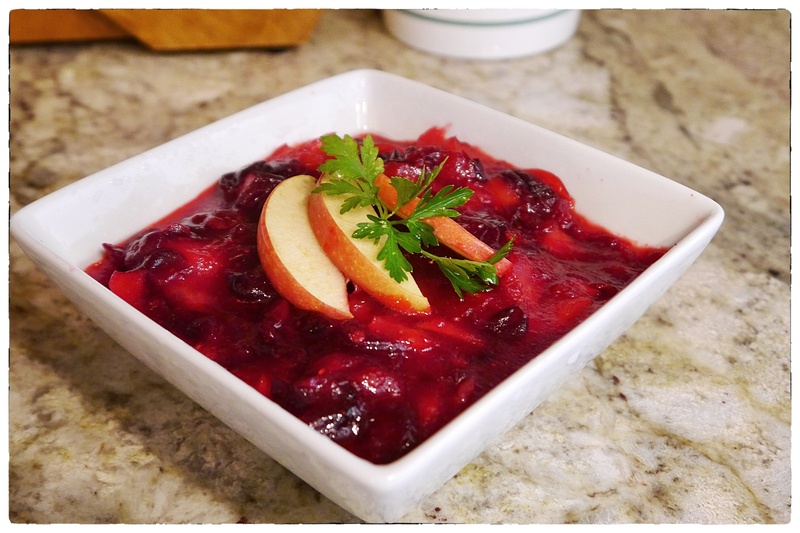 I have compiled some of my most requested holiday recipes for tonight’s exchange. JefferyW makes Cornbread Stuffing, (pictured above) part 1 here and part 2 here. Roasted Butternut Apple Soup makes a great starter, recipe here. Hearty Garlic Mashed Potatoes, click here – my family loves these, though the first time I made them they mocked me until they were served because the cooking method is so unusual. I cook them early and keep them warm in a slow-cooker while everything else cooks and stove top space is at a premium. 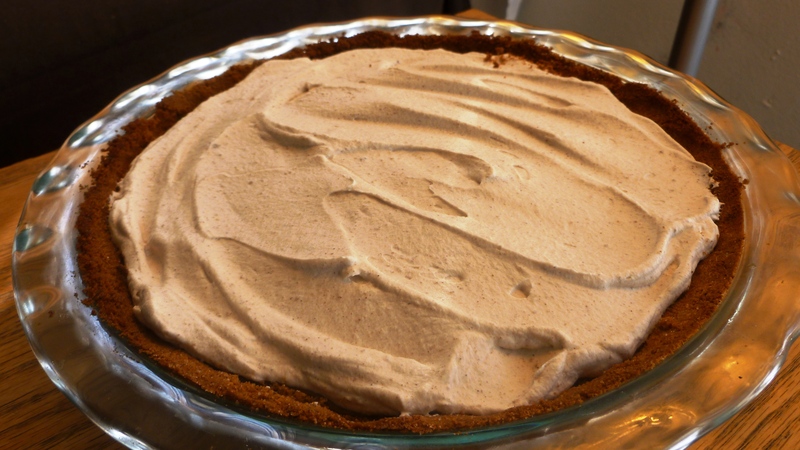 There will be a variety of pies this year, but instead of the traditional Pumpkin Pie, I’m making Pumpkin Cream Pie (above), the recipe is here, plus there are additional pumpkin dessert ideas at the link. For the main course, we’ve made turkeys a bunch of ways here, including a Spatchcock Turkey, recipe here. 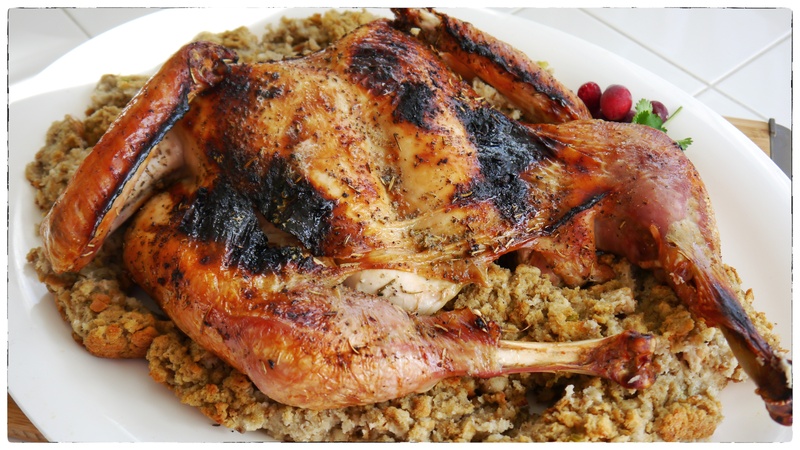 For something more traditional, here are some ideas from people smarter than I am: turkey four different ways, good stuff here. What’s on the menu for your Thanksgiving this year? 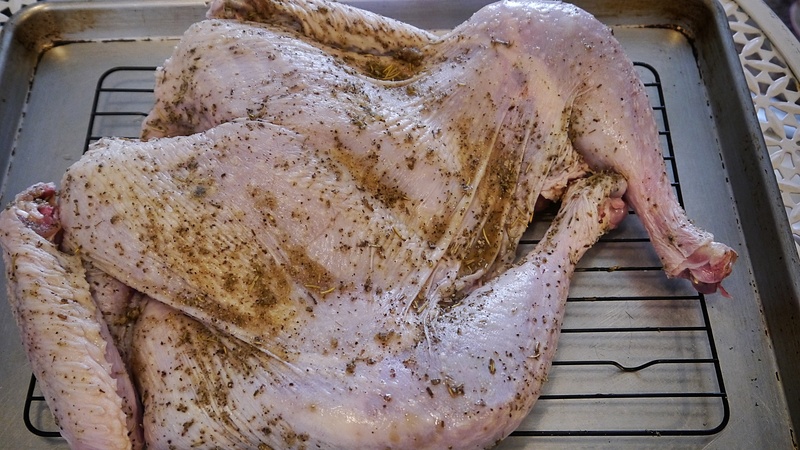 Do you have a must-have recipe for your holiday dinner? I’m not a fan of traditional candied sweet potatoes, so tonight’s featured recipes are some non-traditional styles for sweet potatoes. In saucepan, add water, steamer and sweet potatoes. Steam until you can easily stick a fork in them. They don’t need to be completely soft. About 10-15 minutes. Add sweet potatoes to casserole dish. Combine oil, butter and spices. Pour evenly over potatoes. Cover and bake at 375 degrees for 25-30 minutes until potatoes are soft. You can adjust cooking time if you prefer your firmer or softer potatoes. I wanted to tackle breakfast because with lots of people visiting over the holidays, it can be fun to do something special for breakfast. 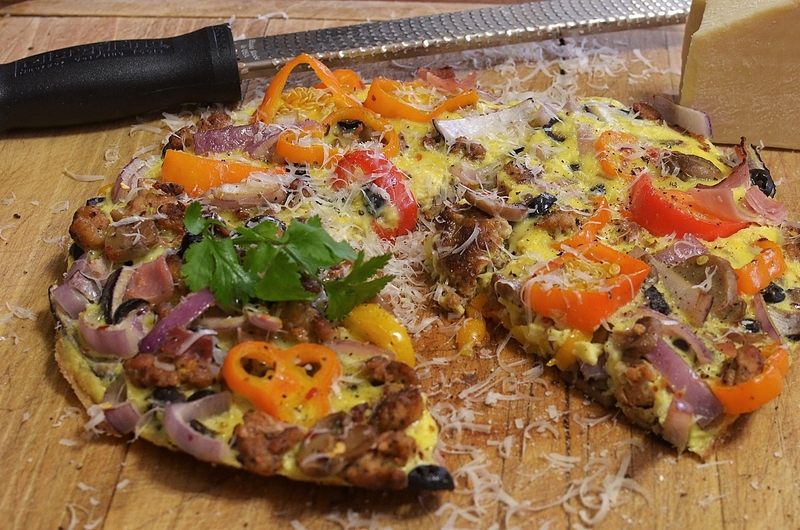 I had a breakfast pizza recipe tucked away for a while and I was on the hunt for the perfect crust. I finally stumbled upon some terrific flat bread, something I have been looking for since moving to Colorado. I was spoiled in Boston and LA, where every store had a locally made brand stocked. So with a nice flat bread I was ready to tackle tonight’s featured recipe. But let’s begin with something sweet that was great fun to get the kids involved with, French Toast Rollups, recipe here. I like this Sour Cream Pecan Coffee Cake because, well, pecans and streusel, but also because I can make it and leave it out for everyone to enjoy at their leisure with coffee. I also have a Blueberry Coffee Cake, along with a full dinner menu and recipes here (because coffee cake, not just for breakfast). Finally, for Blueberry Sour Cream Pancakes, click here. What’s on your plate for the weekend? If you’re cooking for Thanksgiving, what’s on your menu? For tonight’s featured recipe, I snagged some of JeffreyW’s photos (top and middle of the post) to illustrate the many forms these pizzas can take. I made single pizzas, topped with an egg and lots of cheese. The ideas are endless. But below is a recipe for the basics. 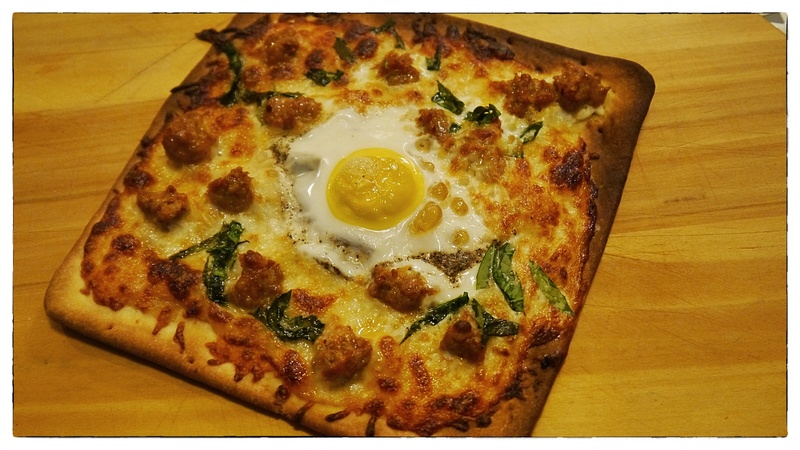 Toppings: I used olive oil, breakfast sausage, mozzarella, spinach, garlic and an egg for each individual pizza. 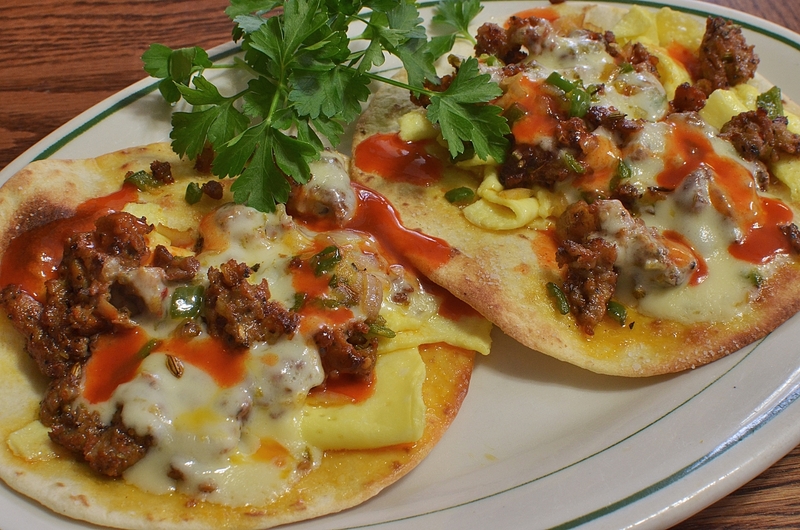 To assemble: on a baking sheet arrange the crusts, brush lightly with oil, then spread roasted garlic, add crumbled (uncooked) breakfast sausage and shredded cheese, leaving a space in the center for the egg. I used the sausage and cheese to create a well for the egg. At this point you have two choices, you can leave it on the baking sheet or move it to the oven rack. Because I was using flat bread and it was stable, I moved it to the oven rack and then added the egg into the well (I cracked the egg into a bowl and then transferred to the pizza, it seemed a smarter way to manage it all). You can also scramble the egg and pour slowly over the ingredients. Bake at 450 degrees until the egg is cooked. I lost track of time and let the egg cook too long, I would have preferred a soft yolk. Remove, top with chopped spinach and serve immediately. And for those who missed it, dinner menu this week is Spicy Potato Soup and Mocha Cake, menu, recipes and shopping list here. Great for a non-turkey meal to serve to company. With Thanksgiving coming up, I wanted to highlight some different sides besides the traditional. This one really fit the bill. 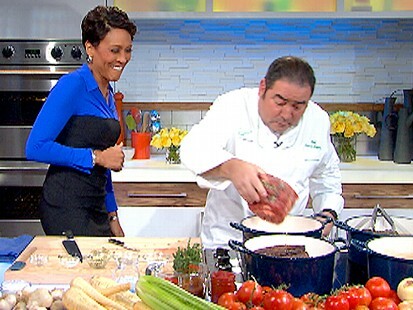 Emeril Lagasse’s phrase, “kick it up a notch” became famous for a reason—the New Orleans-raised chef raises flavors to the next level. This year, take your Thanksgiving to Emeril’s star status with his recipe for Pan-Roasted Brussels Sprouts with Caramelized Onions and Crispy Pancetta. In a large sauté pan, heat 1 tablespoon of the oil over medium heat. When hot, add the pancetta and cook until crisp, 5 to 6 minutes. Using a slotted spoon, transfer the pancetta to a baking sheet lined with paper towels and set aside. Add the onions, ½ teaspoon of the salt and ¼ teaspoon of black pepper to the pan and cook, stirring until the onions are caramelized, about 30 minutes. In a large 14-inch sauté pan, heat the remaining 2 tablespoons of olive oil over medium high heat and when hot, add the Brussels sprouts and the remaining salt and pepper. Cook until the sprouts are golden brown on one side, 4 to 5 minutes. Transfer the pan to the oven and cook until tender, about 15 minutes. 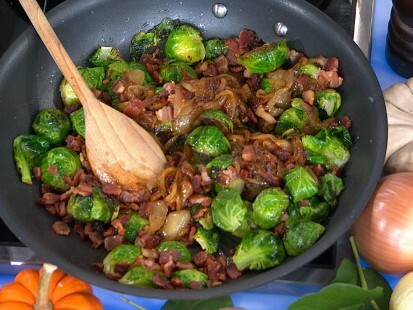 Add the onions and pancetta to the Brussels sprouts, toss well, and return to the oven for 5 minutes longer.